Are you planning a vacation sometime in the near future? If you are, then you will probably be making plans well in advance to ensure that everything is taken care of so that you can have a stress-free trip. If you have pets, traveling may actually be one of the most stressful things that you will ever do. There are so many different options for pet owners when they travel with pets. Some prefer to board their pets, while others may hire a pet sitter to come care for their pets while they are away. That doesn’t mean that more and more people are not choosing to travel with their pets these days. If you are planning to travel by plane with your pet, there are things that you will need to be aware of. It is something that requires a great deal of planning, because there are a lot of rules and regulations that go into plane travel with pets. The good news is that we have done the research for you! Here you will find the complete guide to plane travel with pets. We hope that this guide will make it easier for you to plan your vacation. Should You Choose Direct vs. Layover? Direct flights are always best when it comes to pets. In fact, sometimes the airlines won’t even allow pets on a flight that requires a layover. It can be difficult to get the pet from one baggage compartment to the next. If you are going to be carrying on board with you, then you might be able to have a layover with no problem. In fact, if you carry your dog on and you have a layover, you will be able to take them out to relieve themselves more often. This is something that you can’t do when you are on a direct flight. So, really the choice is yours. If they allow pets on flights with layovers, just make sure that the layover gives you enough time to get your dog out to go potty and still make it to your connecting flight without running the risk of missing your flight. As you plan out your travels with your pet, you will probably need to be aware of the health requirements. Most airlines will require you to have some sort of health certificate from your veterinarian. It is a good idea for you to talk to your veterinarian and get a health certificate just to be on the safe side. You also need to call in advance and see if there are certain immunizations required. Each airline is different and the requirements change so often that it is really just best to call before you book your flight. If your pet is not in good health, it is never a good idea to travel with them (especially not by plane). For this reason, even if a health certificate is not mandatory, it is still a good idea for you to have them seen by your vet to ensure that they are healthy enough to travel. When you are first booking your flight, you will want to make sure that you make your reservations properly. You will need to decide whether your pet will travel on board with you as a carry on, or whether they will go with your checked baggage. There are a lot of factors that need to be considered before you make this decision. First, you need to ask your airline what they recommend, because some airlines may actually have preferences when it comes to pet travel. What is the best option – cabin travel or cargo travel? Dogs, cats and birds are all allowed to travel in the cabin, rather than being put in the cargo, but is that the best option? Some people argue that they travel best in the cargo hold because it is temperature controlled and pressurized. Others say that it is too scary for them to travel with checked baggage. The truth is, there isn’t one simple answer for anyone. You have to take your pet’s particular needs into consideration before you can decide what is best for them. These specifications are the same for both carry on and checked baggage. You cannot assume that a cute, frilly doggy purse is going to be suffice. They will likely turn you away at check in. You should always double check to ensure that your baggage is adequate and safe for plane travel when you make your reservations. Now that you know more about making your reservations and getting the right type of carrier for your pet to travel in, it is important to know what you need to do to keep your pet safe through the baggage claim. Step 1: Choose Your Flight Carefully – A nonstop flight is going to be your best option. This means that you don’t have to switch flights at a layover, and this is a whole lot easier when you are traveling with pets in the cargo area. Try to find a non-stop route, even if it means taking a different airline. Step 2: Use a Sturdy, Nice Sized Crate – Your pet will be spending all of their time on the plane in the crate. You want them to be comfortable, and you also want to make sure that they will be safe in the crate. Don’t get something that may just fall apart on you. Step 3: Avoid Plastic Hardware – A majority of airlines are requiring you to use metal hardware instead of using plastics, because this gives your pet more security inside of their crate. You never know when a plastic piece could snap, allowing your pet to run free. Step 4: Use Cable Ties for Added Protection – Even with metal hardware, you can never be too careful. It is a good idea for you to cable tie the door shut just to make sure that your pet can’t get out the door. Step 5: Use Adequate Identification Measures – If your pet were to get loose somehow, you will want to make sure that they have identification that will not only ID them, but will help them find their way back to you. Label their crate, and their collar with your information, including your name, address and phone number, hotel name etc.. Step 6: Stay Proactive – Don’t just trust that your pet is going to be properly cared for. You need to keep a copy of the pet travel regulations on hand, and make sure that you stay on top of things to ensure that your pet has a pleasurable travel experience. Medication Options – if your pet has anxiety issues, then you may need to talk to your veterinarian about medication options. While most airlines recommend against tranquilizing your pet, it doesn’t mean that you can’t give them some type of medication but the truth is, tranquilizing your pet can be pretty dangerous. It can affect their breathing, and because the cargo compartment is pressurized it can be a liability and most airlines won’t even take pets that have been tranquilized. Instead, talk to your vet about medications that will help to calm them. Also, consider natural calming methods. Eating and Drinking Before the Flight – While you don’t want to starve your pet and withhold water from them, you don’t want to overload their stomachs right before the flight. It is best to give them a light meal to ensure that they won’t get sick from an empty stomach. You also want to give them only limited amounts of water, and make sure that you let them go outside to relieve themselves before you board the plane. Once you board the plane with them, they won’t be able to go back outside until you get them from baggage claim. Talk to Your Veterinarian – Aside from discussing medication options for your pet’s flight, you will also want to discuss any concerns that you may have with your veterinarian. They are highly knowledgeable when it comes to all things pet related, so it just makes sense to get their expert advice before hand. When you get to the airport with your pet, you may not know what to do first. First, you will start by checking in at the front desk. Let them know that your pet will be traveling with you. It is a good idea to get to the airport around 2 hours before your flight. They recommend one hour ahead when you are traveling without pets, so you will need more time to get everything in order when traveling with pets. There may be some paperwork that you need to fill out, and this will all be provided to you at the check-in counter. After you get checked in, you will then need to go through security. Getting through airport security by yourself is usually a challenge, but toss a pet in the mix and it can seem downright impossible. Clearing airport security with your pet in tow may be a challenge, but it’s doable. Typically, you will be asked to take your pet out of the carrier and walk them through the metal detector. Then you will put their carrier through the x-ray machine. When you first get on the plane, your pet may be somewhat nervous. They may whine and cry in their crate. One of the best ways to ensure that your pet is calm on the flight is to introduce them to their carrier a few times before the flight. You don’t want their first time in the carrier to be when you are on your way to the airport. This can make them that much more nervous about traveling. If you condition them to their carrier, it will be easier on them, and easier on you! Once you get settled into your seat, you will put your pet’s carrier down under your seat. Talk to them and try to calm them with your voice. Once they are in their spot, you don’t want to move them around during the flight. This can put even more stress on them. It is best to get them settled in for the flight and leave them alone. Some people want to know if it is okay to give their pet food, water and treats while they are on the plane, and we always recommend against this. Your pet isn’t going to have a way to go potty, so excessive eating and drinking is not a good idea. Just a bit of water and a snack before the flight will hold them over until you get to your destination. When your flight lands, chances are you will be thinking of your sweet furry friend! You will want to exit your plane and head to the baggage claim area. This is where you will pick up your pet, and any other baggage that you checked before boarding your plane. Once you get your pet from baggage, you will want to take them outside and let them relieve themselves as soon as you can. They will likely be ready to pop, and they may even be a bit scared. This is especially true if they have never been on a plane before. Chances are you will find that they are happy to see you, and they are also going to be really happy to get outside and go potty. Aside from taking them outside, you also need to get them some water quickly. They won’t have had any water or food on the plane, so they will be thirsty and ready for a drink. Have this ready for them as soon as they get outside. They will really appreciate it and they really need it. 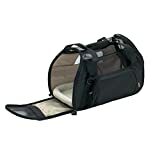 A lot of people prefer soft sided pet carriers, and the number one best seller is the Bergan Comfort Carrier Soft Sided Pet Carrier. This carrier is not only affordable, at under $40, but it is also convenient to use. You can keep it clean easily, and it houses pets up to 22 pounds. It is approved for airline travel, and has convenient zip closures and mesh panels for maximum ventilation. When comfort and ease of use for both important, this is your best bet! When both style and functionality are important to you, consider Classic Accessories Dog Food and Hydration Travel Pack. It is a convenient food and water dispenser that also has a place for you to store treats and medication. It is easy to use, and it has a roll top closure to keep the food fresh. There is a top handle making it easy to carry around, and there are side handles that allow you to pour easily as well. Giving your pet fresh water while you are traveling is important, but it isn’t always easy. With the Heininger 3059 PortablePET WaterBoy, your pet can drink easily. You can put up to three quarts of water in the reservoir, and it is easy to travel with. It is also really affordable, priced under $20. The Solvit HomeAway Pet Travel Organizer Kit comes in a stylish bag and is a great way to organize everything that you need when traveling with your pet. 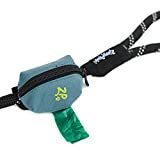 It comes with an organizer bag, water and food bags, collapsible containers for their food and water, poop bag dispensers, mesh pockets to store damp things, and much more! It is also great when it comes to traveling in the car, or going to a sitter for the night. Consider this the ultimate overnight bag for your pup! It is affordable too, priced under $40. The Deluxe Pet Airline Travel Kit is the best $20 you will spend when you are traveling with your pet! It includes spill proof food and water cups, metal securing fasteners for your kennel, ID tags for your pet and their carrier, and a breathable mat for them to lie on. It really does have just about everything that you could need to make your pet’s traveling experience easier on them, and on you! Most of the dog kennels are not too soft on the bottom, and your dog will likely be spending a lot of time laying down on the flight. To make them more comfortable, consider a roll up pet mat such as this one! This mat is 36” by 24”, and is machine washable for easy clean up. It will offer soft padding and warmth that your dog will appreciate. You can get it for less than $40, and it is a great investment for your pup’s comfort! This accessory won’t even cost you $10, but it will become your best friend when you are traveling! It can be secured easily to your pup’s leash, making it easy for you to keep up with your poop bags. After all, you can’t just leave their mess behind and picking it up isn’t always easy if you don’t have your handy bags. It even comes with a free roll of bags to get you started! DOG CALM a Relaxing Non-Medication Supplement Quiets Anxiety and Aids Restfulness. Natural Herbs Reduce Stress, Fears of Fireworks, Thunderstorms & Travel. Calms Hyper & Nervous Behavior. 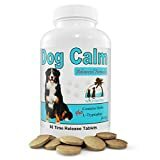 Dog Calm is a relaxing, non medicinal supplement that helps to calm your dog down before you travel. It is also great for thunderstorms, fireworks and other things that put your pup under stress. If you want your dog to travel without barking, but don’t want to go with tranquilizers, then Dog Calm is a great natural alternative. It is made in the United States, and you can get 60 chewable tablets for under $25. As you can see, there is a whole lot that goes into traveling with your pet. With the help of this guide, and these awesome products, you are sure to have a pleasant traveling experience! Seems like an overall chore to deal with this sort of thing. I would hate to have my dog sit on a long flight, especially being all alone and stuff. It kind of scares me in a way, plus I hate leaving my dog unattended. I think the best way to go is a road trip. But some people would probably prefer other ways.